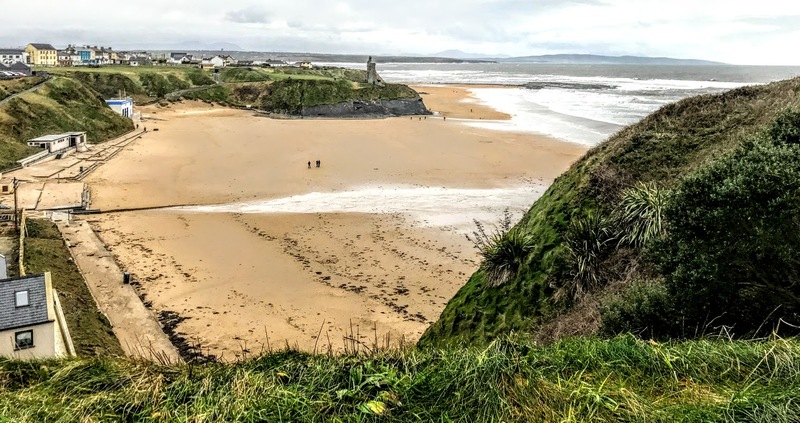 Despite the storms and high winds that have swept across Ireland earlier this week, the weather has calmed down in much of the south-west, and the rain showers are interspersed with hours of winter sunshine. Still resolved to keep to my New Year’s resolve to increase my daily walking average, two of us headed west from Askeaton yesterday afternoon [5 January 2018], planning a walk on the beach. At this time of the year, Ballybunion in north Kerry is still surprisingly popular. Perhaps it’s because the school holidays have not yet ended, perhaps it’s because some people are grateful for a break in the wintery weather conditions. We found ourselves on a track we had not yet noticed. The Cliff Walk is an easy one-hour cliff-top walk above the blue-flag beaches of Ballybunion. There are rocky headlands, high cliffs, sea stacks, caves, and hidden sandy coves. 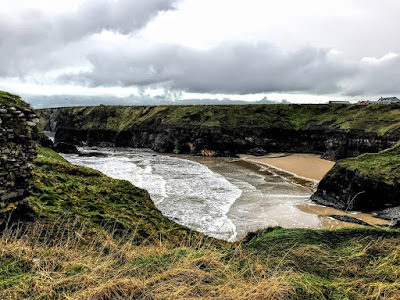 The full Ballybunion Cliff Walk takes about an hour and takes in both the north and south beaches. The track is well-fenced without interfering with the breath-taking views. Some caves are reputed to have been the lairs and hidden strongholds of chieftains, Vikings, smugglers and pirates. All the warnings along the way cautioned us to stay to the marked paths. But the ground was soaked after recent rainstorms. Yes, we enjoyed the exhilarating experience and the Champagne air. But eventually our feet were soaked thoroughly, and we retreated to the safety of double espressos at Daroka, a cosy and welcoming restaurant and café on the corner of Cliff Road and Main Street.